The CogAT® (Cognitive Abilities Test™) is used by many school districts to qualify children for their gifted and talented programs. 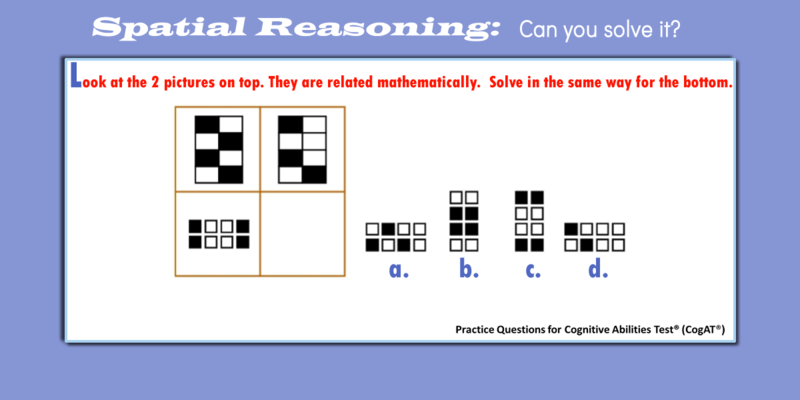 This test assess your child’s thinking, reasoning and problem solving — it does not measure what your child has already learned. The CogAT is a powerful tool in measuring areas that students could potentially excel in, or identifying areas that need improvement. The key to answering this question is in the prompt. They are related mathematically and are based on the top two. So what does your child notice about the top two mathematically. The first one on the left has four black squares and the one on the right has three, and there is no rotation of the layout. Therefore, b and c can be eliminated, since they both contain four black squares and have rotated 90 degrees. Then your child has a and d to choose from. If your child chose a, then he or she is correct! How Should My Child Practice for the CogAT? The questions in the CogAT cover cognitive abilities that are not specifically taught in school. These are abstract thinking abilities such as problem solving, classifying and categorizing, recognizing patterns and sequences, reasoning with shapes and figures, deductive and inductive reasoning, mathematical reasoning, and more. It’s important to build the underlying skills for the test by giving practice questions. Watch for these common mistakes as your child practices sample questions at home. I have seen that children, no matter how bright they are, may not perform well on tests if they have no test taking experience, and specifically, no practice with the format and structure of a particular test. READ CAREFULLY: Have your child read each question carefully, so he or she doesn’t misunderstand directions. REST: Make sure your child is well-rested and has eaten a healthy breakfast. This will help your child focus during the assessment. SLOW DOWN: Have your child slow down and not rush, so he or she doesn’t fail to consider ALL the answer choices. LISTEN: Make sure your child listens carefully to each question asked. MAKE A GUESS: Teach your child not to give up when they aren’t sure, but rather teach him or her to eliminate obviously wrong answers, then to make the best guess. This way your child doesn’t lose time getting stuck on hard questions. As you observe your child working through this practice test, watch for these common mistakes and gently make corrections. With your guidance and lots of practice, your child will be able to perform at his or her true ability for a fair and accurate evaluation during the actual test. What is the format of the CogAT? In 2011, Riverside Publishing issued the 7th edition of the CogAT® Test – Form 7. While some schools may still be using the old Form 6 of the test, most are transitioning to the newer Form 7. One of the biggest differences between the two versions of the test takes place with primary level questions (Kindergarten – 2nd grade). On the Form 6, these questions are word based. On the Form 7, they become picture based and there is less requirement for the teacher to read the questions each time. Hole Punch questions (sometimes called “Paper Folding” or “Figure Analysis” questions), which did not start until the older grades on Form 6, now start at the Kindergarten level on Form 7. Here are a couple of CogAT practice questions to get your child started. Look at the shapes on top. They are alike in some way and so they belong together. Choose one shape from the bottom row that belongs with the figures on top. Take a look at the pictures across the top. They show a piece of paper being folded. Then, one or more holes are punched in the folded piece of paper. Can you touch the answer that shows what the square piece of paper will look like when it is unfolded? How is the CogAT Test Scored? For other tests on this site, go here to Tests.